One new dad's blog about baby research. From gear, to experiences, to research. 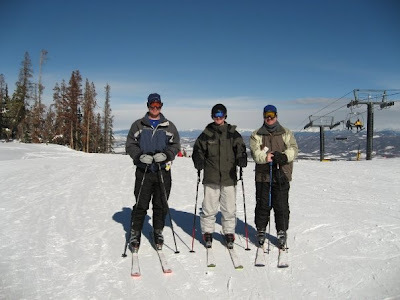 If you have a family, and like skiing (or someone in your family likes skiing), let me recommend Winter Park, Colorado. Why? Because there is something for everyone. Unlike some great ski locations, Winter Park has a descent small downtown where you can find a variety of spas, rentals, snowmobiling, and best of all: a full grocery store. Winter Park resort has a HUGE kids building, so that when they get tired of skiing the parents can go back out and hit the slopes. Of course if you have teenagers, the parents are likely to call it quites while the teens explore the variety of slopes. In that case, might I recommend Doc's to get a nice adult beverage and unwind. From the Fredericksburg area, you have several options for how to get to Winter Park. We chose to cash in some airline miles and take American out of Richmond. I love flying out of Richmond because of the security lines. The other recommendation is to go to Dulles and take one of the direct to Denver flight. - Drop by the visitors center/chamber of commerce in downtown Winter Park and get 2-for-1 lift ticket coupons. - While there, pick up 2-for-1 rentals at Beavers Sports Shop. - Have a camera nearby at all times, while out in the hot tub, the local fox decided to cruise by several times. - A couple of family radios will help with keeping track of people, but they may not work if you're completely around the mountain. We used them to figure out who was stuck in the woods. Fredericksburg VA Blogger interested in just about anything.